Today I did something I’ve never done before. I spent 90 minutes inside a float tank (or sensory deprivation tank) in complete darkness and silence, floating ever so peacefully at a local massage center. It was a deeply relaxing, amazing experience. I first heard about sensory deprivation tanks many years ago – I think in reference to Michael Jackson. They’ve been around for about 60 years. Though the idea sounded intriguing, I didn’t give it much thought until I came across a brochure for the Saratoga Springs Float Spa when I was in town last week – and called to make an appointment as soon as I got home! I’ve been experiencing a lot of anxiety lately and wanted to try something new to relieve the stress. 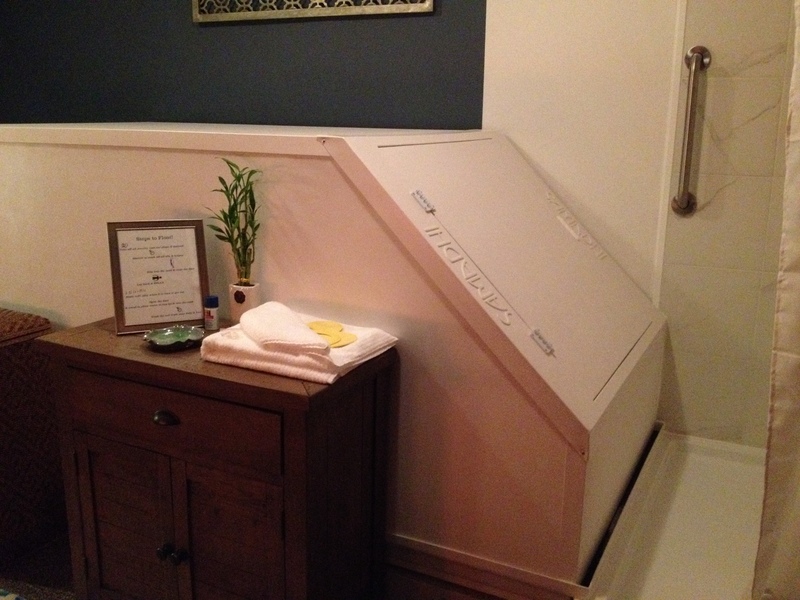 The float tank was located in a tranquil, dimly lit room with a harmonious, feng shui decor that matched the rest of the massage center and the warm and welcoming energy of owner, Tyler Fedigan. It felt like a very protective and nurturing space. Next to the tank was a shower, and I was instructed to shower before and after using the tank. The tank contains about ten inches of salt water (five times denser than the ocean) that is kept at body temperature. There was a dim light on inside when I entered the tank (which felt like entering a cave), and when I pushed the button to turn off the light, I was in complete darkness. When I lay back in the water, my ears were submerged, and the only sound I heard was my breath. It was actually quite loud, almost like a respirator. (I was wearing earplugs to avoid swimmer’s ear.) But aside from that, there were no other sounds whatsoever. I felt safe inside the tank, and it didn’t take long at all to become completely relaxed. The buoyant salt water supported me completely. I floated effortlessly and allowed every muscle in my body to relax. Since the water was at body temperature (“skin-receptor neutral”), it was nearly impossible to discern my physical boundaries. I felt at-one with my environment and was surprised when gentle music began playing under water to signal the end of the 90-minute session because it didn’t seem as though that much time had passed. I tried to do a form of mindfulness meditation in the float tank. However, aside from the sound of my breath, there weren’t any anchors for my attention! Usually when I meditate on my breath, I fix my attention on either the air entering and leaving my nostrils, the elevator-like movement of my diaphragm, or my belly rising and falling with each in-breath and out-breath. However, since I wasn’t aware of my physical boundaries in the tank, I couldn’t focus on the latter two sensations. I could barely feel my body at all! The only time I became aware of my physical boundaries was when I made a slight movement. When I moved, the water felt a bit cool against my skin but immediately warmed up, and I once again lost all sense of physical boundaries, weight, and mass. I just felt weightless and light. Although people’s experiences in the float tank differ, for me, thoughts did not take hold. Any thoughts that started didn’t get very far. They had a very short lifespan. It seemed that, due to the complete absence of external stimuli, there was nothing to sustain them. Any thoughts that arose had absolutely no emotional charge. It seemed that no negatively charged thought could exist in the absence of gravity, light, and sound. All was well. Complete peace. It was a very womb-like experience. Coming out of the tank at the end of the session felt like being born. I emerged covered with extremely salty water, which made me think of a baby being born covered with vernix. My time in the float tank served as a profoundly peaceful experience that I can recall when I’m feeling anxious. I can return there in my mind to facilitate relaxation, just as I visualize floating in my kayak or sitting by my favorite waterfall. I remained extremely relaxed and peaceful for the rest of the day – physically, mentally, and emotionally. I’ve read that this afterglow usually lasts for days and sometimes up to a month! Before leaving, I signed up for additional sessions. Between the heavy workload of the final two months of the school year, the first anniversary of my mom’s death coming up Memorial Day weekend, and other personal matters that have been weighing on me, I think some gravity-defying, deep relaxation in the float tank will be greatly therapeutic! I’m so glad to have discovered this form of relaxation! © Susan Meyer and River Bliss Photography, 2015. Unauthorized use and/or duplication of this material, including all text and photos, without express and written permission from this website’s author/owner is strictly prohibited. Excerpts and links may be used, provided that full and clear credit is given to Susan Meyer and River Bliss Photography (susantarameyer.com) with appropriate and specific direction to the original content.